Twisting prominence. An EIT 304Å image of a large, twirling prominence taken on Jan. 18, 2000. Prominences are huge clouds of relatively cool dense plasma suspended in the Sun's hot, thin corona. 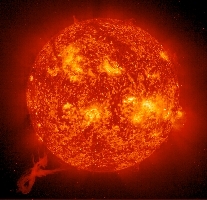 At times, they can erupt, escaping the Sun's atmosphere.